The machine can be set to display a reminder message to clean the machine. Consult your local health codes for cleaning requirements. Press and release menu until the display shows cleaning with the interval setting and countdown numbers below. The right button moves the cursor to right, while the left button moves the cursor to left. Press the top button to change a setting. For example, 007d equals clean every 7 days. 007 equals 7 days to next cleaning. Press menu to save the setting. Max temp. Turn on this setting to display a message if the product temperature is warmer than 39 degrees Fahrenheit, 4 degrees Celsius. Press and release menu until the display shows max temp no. Press the right button. Press the top button. The display shows max temp yes. Press menu to save the setting. Refill. Turn on this setting if the refill option is installed to the machine. For installation and operation, see the documentation included with the refill. Press and release the menu button until the display shows refill off. Press the top or bottom button to select refill on. Press menu to save the setting. Clean the condenser monthly. A dirty condenser will cause the machine to operate inefficiently. These are the tools required for maintenance: a Phillips head screwdriver, a can of compressed air, and a damp towel. Turn off and unplug the machine. Remove the access panels. Place a damp towel over the condenser. Spray the back side of the condenser with compressed air. This will clean the condenser fins and push dirt into the damp towel. Replace the access panels. For all machine cleaning and maintenance, please refer to the operator's manual provided with the machine. For more information on this machine or our other products, please visit us at Vollrath.com. Easily set up your Vollrath Granita frozen beverage dispenser with these simple steps! The video will also cover cleaning instructions, helping to keep your unit running smoothly and efficiently. 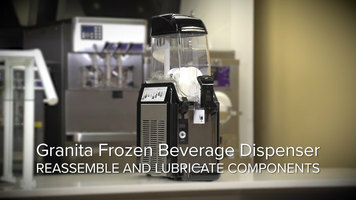 Learn how to properly assemble your Vollrath granita frozen beverage dispenser by watching this video! 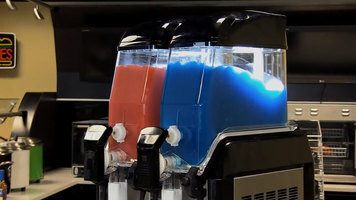 Make sure you properly set up and use your Vollrath granita frozen beverage dispenser for the first time by watching this detailed how-to video! Equipped with an easy-to-read LED display, this Vollrath Stoelting Clear Bowl frozen drink dispenser is one of the most unique and efficient dispensers on the market! Utilizing an auto-defrost mode, you can safe energy overnight when you are closed.